A newly updated, lavishly illustrated account of the ANZACs involvement in the Western Front—complete with walking and driving tours of 28 battlefields. With rare photographs and documents from the Australian War Memorial archive and extensive travel information, this is the most comprehensive guide to the battlefields of the Western Front on the market. Every chapter covers not just the battles, but the often larger-than-life personalities who took part in them. Following a chronological order from 1916 through 1918, the book leads readers through every major engagement the Australian and New Zealanders fought in and includes tactical considerations and extracts from the personal diaries of soldiers. Anzacs On The Western Front: The Australian War Memorial Battlefield Guide is the perfect book for anyone who wants to explore the battlefields of the Western Front, either in-person or from the comfort of home. It does far more than show where the lines that generals drew on their maps actually ran on the ground and retrace the footsteps of the men advancing towards them. It is a graphic and wide-ranging record of the Australian and New Zealand achievements, and of the huge sacrifices both nations made, in what is still arguably the most grueling episode in their history. A complete guide to the ANZAC battlefields on the Western Front—featuring short essays on important personalities and events, details on relevant cemeteries, museums, memorials and nearby places of interest, and general travel information. Carefully researched and illustrated with colorful maps and both modern and period photographs. Includes information about the Sir John Monash Centre near Villers-Bretonneux in France—a new interpretative museum set to open on Anzac Day 2018, coinciding with the centenary of the Year of Victory 1918. 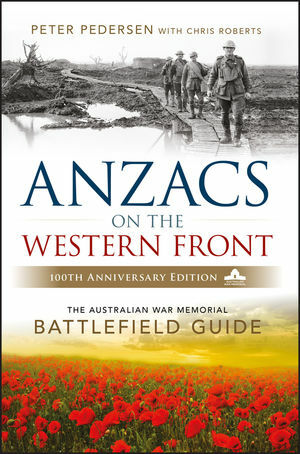 Anzacs On The Western Front: The Australian War Memorial Battlefield Guide is the perfect book for historians, history buffs, military enthusiasts, and Australians and New Zealanders who want to explore the military history and battlefields of their heritage. PETER PEDERSEN, PHD, was Head of the Research Centre at the Australian War Memorial and is one of Australia's leading military historians. On retiring from the Memorial, Dr. Pedersen was appointed consultant historian for the Australian government's commemorative projects on the Australian battlefields of the Western Front. He appears frequently on Australian television and radio and has spoken at military history conferences and seminars in Australia and abroad.